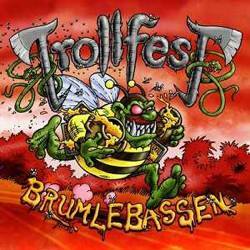 Trollfest are back with their new album, after last year’s “En Kvest for Den Hellige Gral”. If you don’t know the band, a look in the cover artwork will give you a first idea! They come from Norway and they were formed in 2004. They have already released 5 full-length albums in a very distinctive personal style, True Norwegian Balkan Metal. Their different and really unique music caught the interest of labels since their debut, so they released the first 2 albums on Solistitium, the next 2 (including an EP) on Twilight Vertrieb and the last 2 on NoiseArt Records. If you have listened to their previous works, you won’t be surprised that much. But, if you meet Trollfest for the first time, expect the unexpected! Traditional Balkan folk music meets almost every extreme metal genre in a crazy marriage of different styles. Yet the band has an excellent production, with very tight sound and solid atmosphere throughout the whole album. They have found the perfect balance between their folk nature and extreme metal origin. Accordion, saxophone, banjo and many other traditional instruments are competing the speed of guitar riffs and the extremity of their vocals. This time the band has expanded its metal music canvas, adding some more melodic metal elements (including a few lead female vocals) and some acoustic songs. Of course they didn’t loose any of their unique energy and “Brumlebassen” remains very fast and extreme. Their “music playing” skills are remarkable, since all these genres are very demanding, while their songwriting ability is really unique! There are 13 songs totally in the album and they last for 48 minutes. Really, it’s not easy to describe their music more than that, just listen to it! Lyrics are once again in their own invented fictional language, except for the song “Sellout” in English, dealing with trolls, beer, bees and other bugs! Like all their previous works, “Brumlebassen” is an album I enjoyed very much. Trollfest though is a special band and if you are not open to their humorous mood, you will probably don’t get into them. The album is released in limited digipak CD and in gatefold vinyl (and download) including “Konterbier” as bonus track. Each digipak includes an exclusive download code for over 2GB of video, music and photos! It has also one of the funniest and most scientific booklets ever; 20 pages with lyrics and English summaries for each song, as well as many hilarious photos and diagrams full of bees! According to the band “it is truly educational and ready for use in schools”! Visit their official pages for more info and music.